George Fowle was an early immigrant to New England. He was made a freeman in Concord, Massachusetts on 14 March 1639 and living in Charlestown by 1648. He was a tanner. His double gravestone, with his wife Mary, at the Phipps Street Burying Ground in Charlestown states that he died at age 72. Together, they had eleven children and left a will probated on 3 October 1682. The best source for information on the Massachusetts Fowle family is the book Descendants of George Fowle (1610/11? – 1682) of Charlestown, Massachusetts by Eugene Chalmers Fowle, New England Historic Genealogical Society, 1990. Generation 1: George Fowle, born 27 January 1610 at Sandhurst, Kent, England, son of George Fowle and Ann Draper, died on 19 September 1682 in Charlestown, Massachusetts; married about 1634 to Mary Tufts, daughter of Peter Tufts and Frances Unknown, born about 1613 in England and died 15 February 1676 in Charlestown. Eleven children. 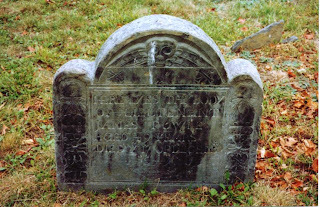 Generation 2: Lieutenant James Fowle, born about 12 March 1643 in Concord, Massachusetts, died on 17 December 1690 in Woburn; married in 1666 to Abigail Carter, daughter of John Carter and Elizabeth Kendall, born 21 April 1648 in Woburn, died 11 May 1718 in Woburn. Eight children. Generation 3: Captain James Fowle, born 4 March 1667 in Woburn, died 19 March 1714 in Woburn; married on 2 October 1688 in Woburn to Mary Richardson, daughter of Joseph Richardson and Hannah Greene, born 22 March 1669 in Woburn and died 23 October 1748 in Woburn. Twelve children. Generation 4: Mary Fowle, born 18 June 1689 in Woburn, died 9 March 1762 in Woburn; married on 17 June 1714 in Woburn to James Simonds, Jr., son of James Simonds and Susanna Blodgett, who was born 1 November 1686 in Woburn and died 30 June 1775 in Woburn. Nine children. I am the son of Martha Franklin Fowle, our branch of the Fowle family located in Virginia in the late 1700s, though they kept close contact with their New England family. The Fowle family were major leaders in Alexandria throughout the 19th century, bringing water and gas to Alexandria, while disagreeing with secession, taking a major role in the Army of Northern Virginia. One direct descendant fought one of the last duels in Virginia. Weathervane Wednesday ~ A Cow on a Birdhouse? Weathervane Wednesday ~ A Hummingbird!